More than seven million students nationwide are chronically absent from school—missing so much school, for any reason, that they are academically at risk. Starting as early as preschool and kindergarten, chronic absence erodes students’ ability to learn and achieve in school. It increases the likelihood that children are unable to read well by third grade, fail classes in middle school and drop out of high school. Children living in poverty are two to three times more likely to be chronically absent—and face the most harm because they lack the resources to make up for the lost learning in school. Communities In Schools is working to eradicate the barriers that keep kids from making it to and staying in school. Attendance Works is a national and state initiative that promotes better policy and practice around school attendance. 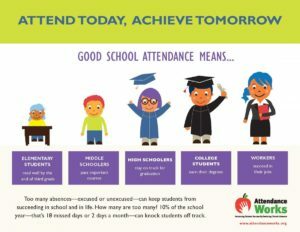 Visit attendanceworks.org for a range of resources, including how parents and schools can help improve attendance. September is Attendance Awareness Month. A toolkit, promotional materials, and resources are available. A Plaque of Empty Desks: US News & World Report by Dale Erquiaga, President of Communities In Schools. Click here to read the op-ed. Policy Brief: How to Leverage the Every Student Succeeds Act to Reduce Chronic AbsenteeismCommunities In Schools latest policy brief highlights the Integrated Student Supports model as a student-support centered approach to reducing chronic absenteeism. Click here to read more.